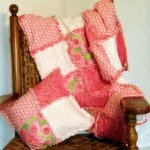 Once you decide on a theme for your design, you need to purchase or make your diaper cake ingredients. There are basic ingredients that will be needed for any design that you choose. 50-75 disposable diapers in size 1 or 2, depending on the number of layers you wish to make. Watch for the prints on the diapers, as many brands these days have all sorts of characters on them. Some store brands have fun and simple prints that can easily be covered or used as part of your theme. Cake base - this can be a sturdy round or square piece of cardboard that you cut yourself. Or you can purchase a cardboard cake holder from a party supply store, craft store or even your local bakery. Those sold in stores tend to come in packages of five. 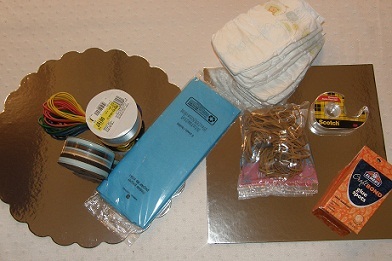 Another idea is to use an inexpensive plastic or metal tray that you can also purchase from a party supply store. Rubber bands - varying sizes as you'll need some small to fasten individual rolled diapers and larger ones that can hold together an entire layer of diapers. If you can find clear small rubber bands, they are great for the individual rolled diapers. Ribbons - you can use a single style and color of ribbon, but be sure it's about 11/2" wide to cover the rubber bands holding together your layers. It's also a lot of fun to use a variety of coordinating ribbons, even in varying widths and prints to decorate your diaper cake. Curly ribbon in a variety of colors are useful too! Double back tape or glue dots - secure ribbons and other decorative items in place. Hot glue gun and glue sticks - sometimes you need a little extra gumption to hold heavier or awkward items in place. Just be careful where you use the hot glue so as to not damage the actual gift items on your diaper cake. Center core - can be baby bottles, tall bottles of baby shampoo or lotion, paper towel tube or possibly the whole paper towel roll. 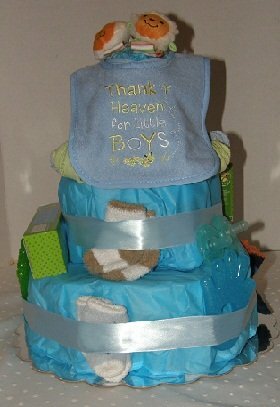 In our Little Boy Blue diaper cake, we used a tall bottle brush that had it's own suction cup stand for the core. Tissue paper/wrapping paper - if you would like to cover the layers of diapers for an "iced" look to your cake. Items to "decorate" your cake - pacifiers, rattles, teething rings, toys, baby washcloths, onesies, small books, bibs or whatever your imagination would like to bring to the cake. Colored cellophane basket wrap - if you would like to wrap your entire creation. Just be careful to not pick your diaper cake up by the cellophane wrap. Always carry the cake from the bottom.